Monolith Productions found great success when they released Middle-earth: Shadow of Mordor three years ago. They twisted the Tolkien lore and created an action game that was a great blend of brutal combat and rapid stealth. Their biggest success came from the nemesis system, which involved a randomized battlefield of orc captains, with different traits, that would fight the player and each other. The procedural system forged natural adversaries via challenge, behaviour, or circumstance. Shadow of War is much larger and more challenging than its predecessor, with more regions to conquer and more orcs to purify. The nemesis system has been expanded, as orc leaders are now put to work defending or attacking large forts. The story has been given more focus, although it tends to get in the way more than it should. For this sequel, Monolith has taken the approach that bigger is better, but it doesn’t always pay off. Once again, the undying Talion and his ghostly companion, Celebrimbor, return to build an army of converted orcs to battle the dark forces of Sauron. At the end of the last game the interlinked duo were going to make a new ring of power. As fate would have it, the newly forged ring is almost immediately taken by the spider-woman known as Shelob. Her power rivals her cunning, and she provides Talion with visions of Gondorians suffering in the city of Minas Ithil. The giant spider has no love for Sauron, so the pair (or trio) forms a tentative alliance. Talion starts his fight in the human city as it is being invaded by an orc army, but there is little he can do to stop it being taken over by the Nazgûls seeking a powerful artefact within the cities’ keep. It is easy to play for 10 hours in this starting area, as there are many collectibles to grab, challenges to complete, and captains to cleave. But once the human city is lost to Sauron’s forces, the game starts rolling forward with graug-like momentum. Shelob relinquishes the ring back to Talion, granting him the power to build an army via Celebrimbor's bright hand. Shadow of War offers a much better narrative than the first game merely because there is more of it, and it has a better cast of characters and story arcs. You'll fight a summoned Balrog with the help of an ancient being; you'll rescue humans stranded behind enemy lines; and you'll hunt after Nazgûl trying to take direct control of orcs. Many story quests focus on stealth, which is a welcome relief from the generally hectic action. Most of the narrative is told via in-engine pre-rendered videos, which are good but unfortunately fail to showcase the various weapons and armor that Talion acquires during his conquests; the CGI visions were less frequent but more impressive. Troy Baker voices Talion again, and his performance is nothing special, much like that of his frequent voice actor companion, Laura Bailey, who takes the role of an Elven warrior. Voices from the orc captains, and a few of the other main characters, add much more personality to the adventure. The story is interesting and more focused than its predecessor, with a few returning faces and some laughs, but it does tend to get in the way a little bit for other reasons. The reason it obstructs enjoyment is because the story missions are a mess, both in terms of difficulty and player direction. None of the main quests require a specific character level, or indicate difficulty. The starting point for many of them is in the deepest parts of the most dangerous locations, despite their actual lack of challenge. Many chained quests jumped between four large open areas. It seemed natural to clear forts and gain a foothold in each region, instead of jumping back and forth like a jackrabbit, but doing so meant the story quests were a pushover or a fading memory. When starting a story quest, the orc population changes drastically. Encampments become empty and orc captains might be 15 levels below the norm. It also meant that finishing a stealthy quest might place Talion back in the middle of scores of enemies that were not there seconds ago. That situation isn’t a problem for the undead ranger, since it's easy to sprint away or kill dozens at a time, but it’s a jarring transition. Some of the best games have trouble mixing side quests with main quests, but Shadow of War often feels at odds with itself in how it should be played. Erratic difficulty and poor direction might be forgiven if it weren't for the fact that many of these quests are basically tutorials of features of which you might already be an expert. One late game stealthy quest involved helping a soldier poison grog containers, but I had acquired the remote poison skill about 10 hours previously, making the quest short and pointless. The story quests would have been much better if they stuck to one area, with a few minor diversions, before moving to the next. In that way players could learn the region and its orc army, as that is the best part of the experience anyway. 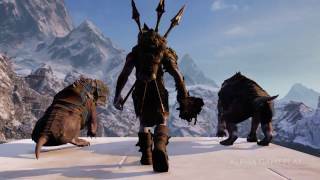 Shadow of War provides five large open areas with random orc armies to battle against, although one of these areas cannot be fully conquered. Fighting the orc captains in these sandbox areas is actually pretty great and generally highly replayable. Arriving in a new area is tough, as you have no information about those currently in power. But as you kill or convert captains, the army composition changes and adversaries are made. Fighting with or against captains is the best part of the game. The sheer number of randomly generated orc captains is impressive. Their variety can shine through in their personality, such as a mumbling spearman that can only muster a single word or a bard that sings during battle. There are many differences in appearance too, with maggot-infested types bursting at the seams. More differences are found in their strengths and weaknesses, as some orcs are vulnerable to being grabbed and others are afraid of fire, beasts, or executions. Exploiting weaknesses is crucial, especially late in the game. Dangerous foes adapt though, like one shielded foe that prevented Talion from leaping over him. Others become enraged after certain conditions are met, increasing their damage output considerably and forcing a retreat. Facing several tough captains at once is fairly common throughout the game. Gathering intel on each is smart, as you can then swap skills or weapons (clumsily) or use the environment to make them suffer. If a captain is particularly strong, use him as a bodyguard or make him a spy. If a captain betrays you, lop off his head in a satisfying bit of revenge. Cutting orcs in half could see them return in a sour state, but that's part of the fun when it comes to the nemesis system. The nemesis system is not just about fighting random orcs, it's about how they interact with each other. Once you have a posse of loyal captains, they can be sent to kill leaders or reinforce others under threat. Special fight pits allow you to watch orcs battle it out, and the victor can become a spy or continue to increase his level until it matches your own. These orco-a-orco fights are fairly short and not without moments of entertainment as you watch the various combat systems work against each other. 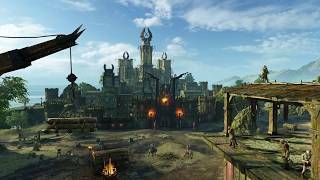 The main goal in each region is to capture a large fortress, home to a powerful overlord and his tough Warchief orcs. Attacking it without removing the Warchiefs is harder, although doing so gives you the chance to convert more followers to your cause. When assaulting a fort, you can assign an attacking team from your roster of captains, with upgrade bonuses like fiery siege beasts or caragor packs, and then you capture objectives by standing in specific areas within the fort. The final stage of fort conquest is to kill the overlord, and this must be done alone. Shadow of War is harder than the first game, but these overlord fights are probably the toughest challenge outside the Nazgûl fights in the story. Fodder enemies constantly respawn which is both good and bad; they can be used to build up hit counters to let you perform executions or other impressive abilities, but they also overwhelm and prevent focused attacks on the main target. Overlord battles tend to be fairly prolonged, although if you come prepared they can be beaten quickly. After the fort is won, you may have lost a few captains along the way but they can be replaced. Even though the game repopulates with new orc leaders eventually, you can add new allied captains by opening loot boxes. No effort was done to integrate these loot boxes into the game world, so it feels tacked on. Loot boxes can be bought with in-game currency which is acquired by killing certain orcs, destroying weapons/armor, or completing objectives. There was plenty of silver coin to open the basic loot boxes on a regular basis, and although they only provide a few orcs each time, it was usually enough to sure up armies. You really don’t need to spend real money, although it would certainly help get your army to full strength faster. The biggest issue with the loot boxes is that they take an eternity to open and deploy. It is no exaggeration to say that it takes less time to travel to a new world region (20-25 seconds) than it does to buy and use the contents of a loot box. This alone makes them extremely frustrating to use. Once you finish the main story thread in act three, after two laborious boss battles, the game throws you back to the world to defend your captured fortresses from progressively tougher assaults in the fourth and final act. There are twenty defences in total, and possibly a few assaults if you fail to hold the line. Defending can take 10-20 minutes, but it feels much longer because it is just constant action. Stealth is basically off the table, although sneaky hit and run attacks are somewhat viable. The battle is all about crowd control, as you run back and forth between control points and either heal friendlies, kill foes, or run up a wall by mistake. You must eliminate specific captains before they grab all control points. Losing a point means the attackers gain another high-rank captain, so there is a bit of a cascade effect if you don’t stay on top of things. The best approach is to set up pre-siege defences, and followers, with attributes that counter those on the assault. Turning enemy orcs can also help with defense. Completing all the sieges will take around 15 hours, roughly half as long as the rest of the game. 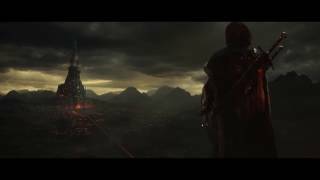 Shadow of War is a big enough game without this final act, and these siege defences should have been reduced or relegated to a post-game endless mode. Despite the grind of these final siege battles, the game holds itself together because of the excellent combat, which remains as fun as the original. It is fast and ferocious, and death comes quickly if you are not careful. Managing arrows, health, hit-counters, wraith, and beasts, while dealing with regular foes and tougher captains, will require your undivided attention. In a battle, Talion might jump over a shielded foe and use the freeze skill to generate critical hits that heal. Then he’ll counter nearby attackers to gain arrows and use the glaive to clear the area so an ally can be saved. Finally, Talion will shadow-mount a flying drake and leap into the air to use a poisonous arrow explosion on a susceptible captain. And he’ll do this all in the space of 15 seconds. When the combat really gets moving, it teeters on the edge of overwhelming. Coming out the other side of combat victorious makes it all worth it, though. Middle-earth: Shadow of War is a bigger, more varied, and harder game than the original. But the bigger they are, the harder they fall. Shadow of War does fall hard sometimes, but it still comes away victorious. The range of orc leaders you will face, and lead into battle, is quite staggering. The nemesis system offers some great situations that come about simply because it was dictated by an algorithm. The story is much better than the original, but the implementation of main quests is haphazard at best and unfortunately gets in the way. The game is also a bit of a grind, partly because the final act repeats sieges ad nauseam. Fortunately, despite its length, the game remains entertaining because of its smart and hectic combat. If you liked the original then you’ll enjoy the sequel, there is no doubt about that. The world is beautiful and fun to explore and the orcs are hideous and fun to decapitate. Players that thought the original was too simple will find the sequel a big improvement, but those that were happy with its compact size might find themselves drowning in a sea of orc heads, trapped against the battlements. Orc designs are exceptional and varied, with excellent lip syncing. Combat animations are fluid. Visuals are quite good although texture resolution was sometimes poor. Combat is crazy and satisfying. Every battle requires something different because the orcs you face are never the same. The story of Shelob and others is compelling, but the missions associated with them are poorly implemented due to inconsistencies. The main campaign is too long and becomes a grind in the final act. Framerates were generally smooth on the PS4 slim. There were a couple of rare animation bugs and camera clipping issues. Using loot boxes was a horrible experience due to long delays. Middle-earth: Shadow of War’s extensive orc variety and improved nemesis system blends extremely well with its hectic combat. While the story is better than the original, the implementation of quests is poor. Attacking and defending forts is great, although overused in the already lengthy campaign.